Canadian FM involvement in Niger began in 2005 when Caistor Centre FMC caught the vision of their pastors David and Jennifer Wright for this unreached Muslim majority country. In 2009 one new congregation affiliated with the FMCiC, a Ministerial Candidate was approved, and a “Church-in-Formation” was inaugurated in Niger. This country is a challenging setting for new church plant growth, so ongoing Canadian partnership with the Wright’s ministry will be needed for the foreseeable future. 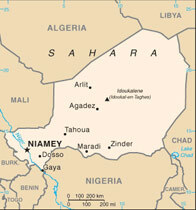 A major project is the development of Ministry Centre in the capital city, Niamey. David and Jennifer are involved in neighbourhood ministry development (church planting), leadership training and coaching, as well as developing discipleship materials appropriate for this semi-literate setting as people from other religious backgrounds comes to faith in Jesus. The ministry centre in Niamey is intended as a multi-purpose building with worship space, training facilities, office, guest rooms and pastoral family apartment. All designed as an eco-friendly, welcoming oasis in this large city on the edge of the desert. If you would like to donate to Wrights, click on “Donate Now”. This will take you to the Free Methodist page on the Canada Helps website, a secure site for online donations. Click on “donate now” and scroll down to Fund/Designation; highlight Global Missions. Just below you will see a box – Message/Instructions – type in clearly “Wrights-support” or “Niger Ministry”.